A-box is a fantastic gift to give movie loving Dads this Father’s Day as they can enjoy receiving a mystery movie subscription box each month of the year. A-box supplies monthly exclusive premium content for film and entertainment fans and enthusiasts. It collaborates with major entertainment and film studios so the products within the boxes are genuine, licenced, exclusive and relevant. The great feature about A-box is that there is exclusive content in every box. 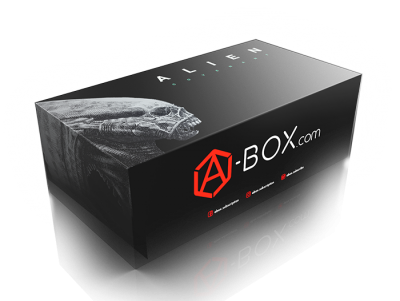 You can choose from a variety of boxes including a limited edition Alien Covenant box full of wonderful merchandise from the film. All the products in the boxes are authentic, licensed merchandise. Included in the boxes are apparel, collectable figures, books or comics, accessories, souvenirs, home goods and desk accessories. All products are sent in a wonderful presentation box that any recipient would love to receive. A-Box include merchandise from many well-known brands such as Marvel, Bandai, DC, Sony Pictures and Paramount. The box I received contained a wonderful selection of products including a Spiderman flexible phone case (that my son loved! ), a Batman notebook with a stylish metallic cover, Guardians of the Galaxy coasters and an Alien Covenant bottle opener. All the products were great quality and I received many positive comments about them. The Guardians of the Galaxy coasters were an especially big hit in the office. Another great feature is that these fabulous boxes are easy to order. You simply choose the box you want and choose the length of subscription you would like. You can choose a 1 month recurring subscription, a 3 months recurring subscription, a 6 months recurring subscription or a 12 months recurring subscription. Prices start from £38.00. A-box is a brilliant gift to give dads this Father’s Day as they will love to receive a box full of merchandise from their favourite films. Dads will also be reminded just how special they are every month they receive one of these wonderful packages. To find out more information about A-box visit www.a-box.com.